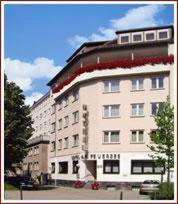 This family-run hotel in the heart of Stuttgart will captivate you, not only due to its central location but also with its personal and pleasant atmosphere. Come and stay here in one of our cosy single-, double- or triple rooms or suites. Get your day off to the perfect start with our hearty breakfast buffet. Enjoy the convenience of good public transport connections, with a direct suburban rail (S-Bahn), taking just 20 minutes to get to Stuttgart airport.